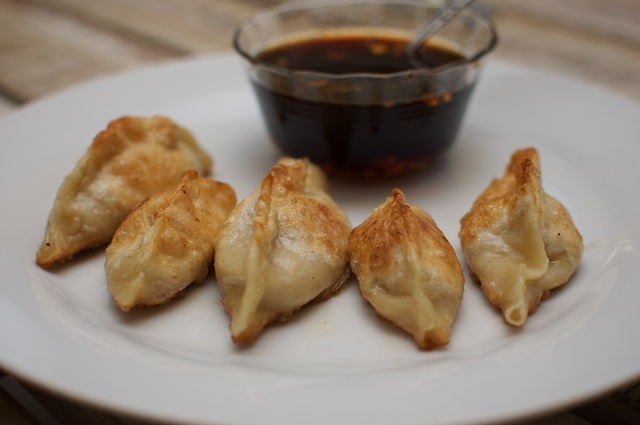 I developed a love for dumplings when I lived in Brooklyn, NY many moons ago. (If you are anywhere near Williamsburg, I highly recommend the seafood dumplings from a place called MShanghai.) During my time there, I had a very functional, flip phone. Mr. FlipPhone had several buttons and I had to press them all several times to create even a single word in a text message. This process, combined with 'predictive text,' lead me to send some very creative messages. I often told my roommate that she was a 'sockstar.' And invited friends to meet me for 'dumkings' at MShangai. Life has changed. My new phone only has one button, and I'm nowhere near good dumplings. So I decided to make my own . . . with significant help from a recipe in Food and Winea few months ago. Am I the only one who didn't know you can make dough with flour and water? I thought that made glue. Nope. You make dumpling dough with ingredients even my brother has in his kitchen. Cover with plastic wrap and let sit for 15 minutes. Return dough to floured work surface and cut into quarters. Roll each piece into a 12 inch rope and cut into 1 inch pieces. Roll these pieces into little dough balls. Roll these pieces into flat circles. Thinner the better. 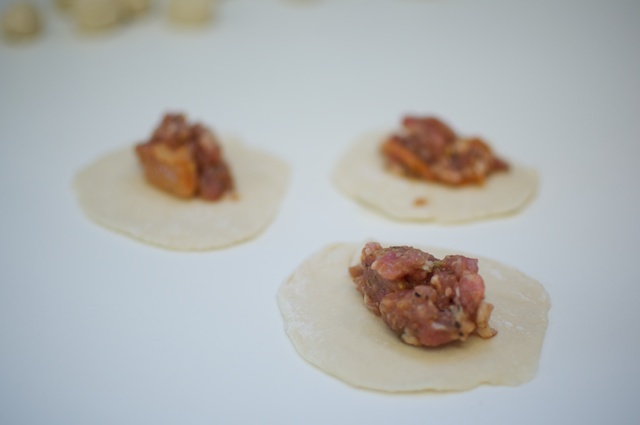 Mix the dumpling stuffing (kimchi, pork, shrimp, whatever you want) and drop a small spoonful in the center of the dough. 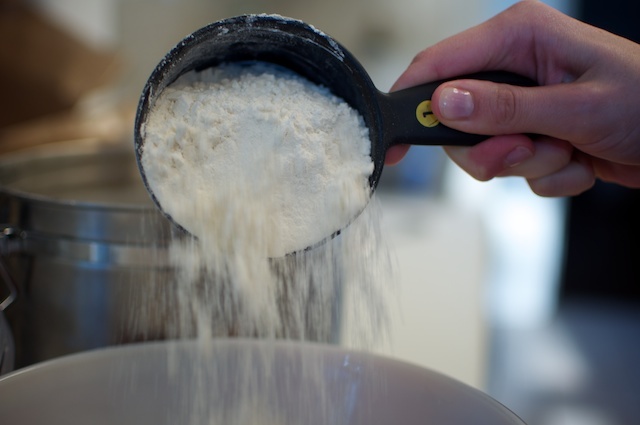 Put flour in medium mixing bowl, and add water while stirring continually. Place dough on floured surface and kneed until smooth, about 5 minutes. Sprinkle with flour, cover with plastic wrap and let sit for 15 minutes. 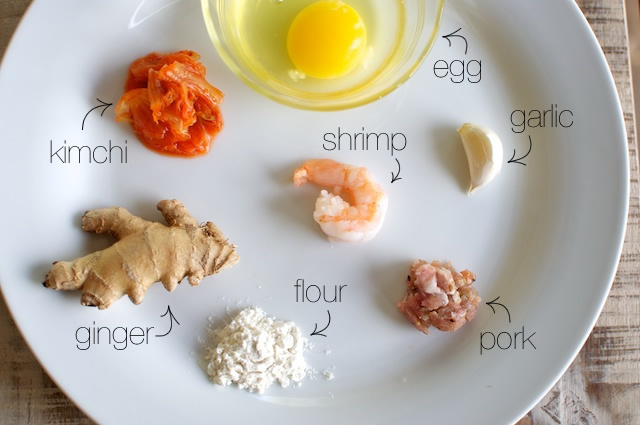 In another large mixing bowl, mix pork, shrimp, kimchi, ginger, garlic, egg and salt. Set aside. 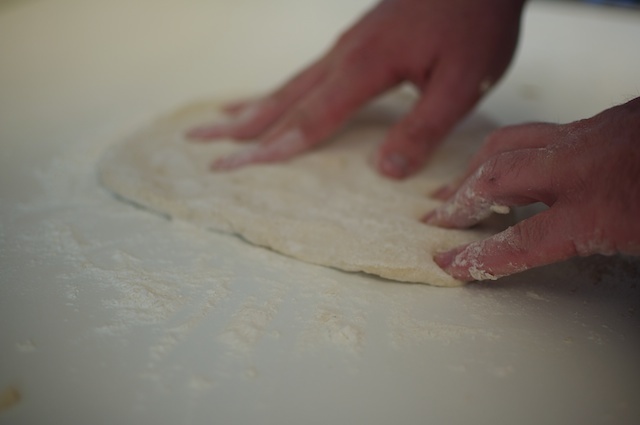 Return dough to floured surface and cut into quarters. Roll each piece into 12 inch rope, and cut into 1 inch sections. 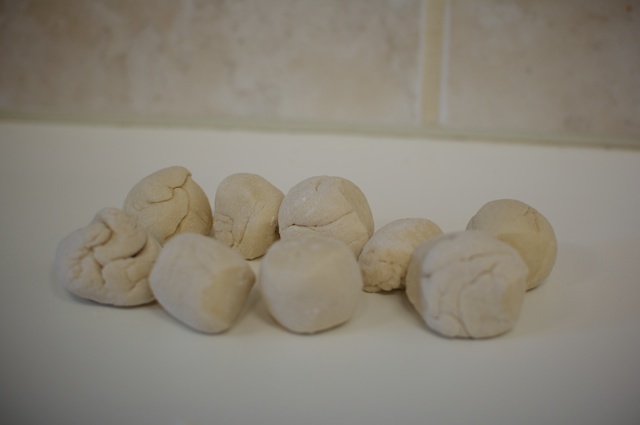 Roll into dough balls with your hands, then use rolling pin (or can/jar/drinking glass) to roll them into round sheets. Thinner the better. Place a small teaspoon of dumpling filling into the middle of the round dough. Pinch dough edges together to create a crescent moon shape, and press lighting on top to make them 'fatter' on the sides. 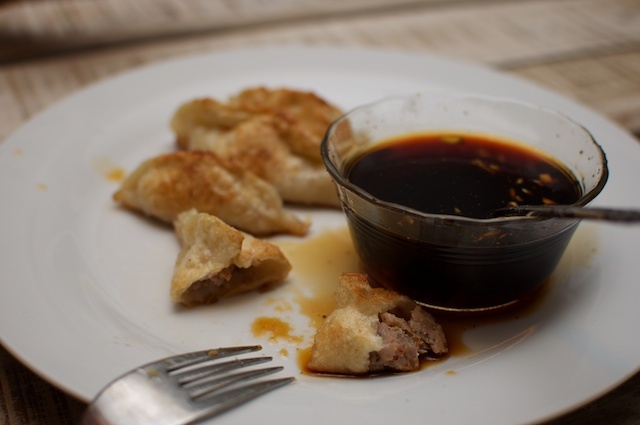 Heat oil in non-stick saute pan, and place dumplings in pan until lightly seared on bottom. Add a cup of water to the pan and top with lid. 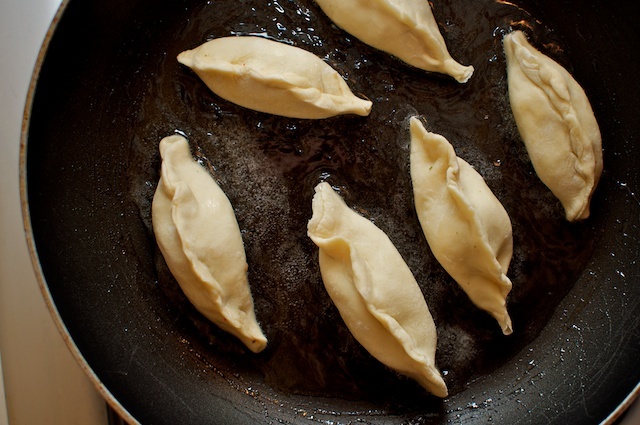 Let dumplings cook for about 5 minutes or until filling is cooked through. Remove lid and let cook for about 1 more minute until bottoms are well browned. 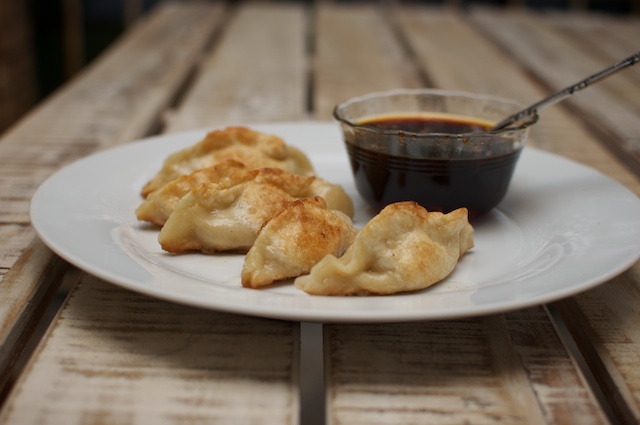 Place dumplings on plate, and mix all sauce ingredients together in a small bowl. Serve and enjoy!